"The Egyptian Embassy in London yesterday received seven pieces of antiquities that date back to the pre-dynasty era from Bonham after intensive contacts with the British authorities and the auction hall officials". I assume that this refers to the auction house Bonham's. The items were apparently stolen from Cairo in 2002. A cache of artefacts hidden in Egypt since 1971 have been released from confiscation. The items include "a number of anthropoid sarcophagi, painted mummy masks, Ancient Egyptian ushabti figurines (wooden statuettes), limestone reliefs, necklaces, amulets, and scarabs, as well as a group of Graeco-Roman statues, Islamic vessels, clay chandeliers and coloured textiles". "The usually sedate town of Abu Simbel was abuzz with Ramses fever as the sun's rays penetrated through the temple to illuminate the eternal king's face". A description of the festivities surrounding the February 22 equinox, when the sun's rays travel through the temple of Ramses II to illuminate the king's face. The third item on this page: "Dr Hawass revealed that the SCA has suspended the archaeological agreement signed with the Qatari Antiquities Authority because the latter failed to fulfill its commitment of subsidising the translation of foreign books released in Tel El Amerna." Other pieces of SCA news are also described in brief. A brief discussion of Egyptian sites listed as World Heriage Sites by Unesco, and some of the issues to be raised at the forthcoming conference in June this year. The curse of Tutankhamun continues to plague Egyptology, although I bet Zahi Hawass is chuckling happily at this one. Hawass is rushing to the rescue of a woman who believes that ownership of a piece of jewellery possibly stolen from the tomb of Tutankhamun has conferred the tomb's curse upon her loved ones. Hawass has promised that a delegation from the SCA would go to South Africa to bring the scarab back to Egypt. Although this dates back to 2003, I have only just found this article which, however, is timeless. Current World Archeaology magazine has on online version of issue 1 of its magazine, in PDF format. One of the articles discusses what the city of Amarna would have looked like when it was occupied, and has some super plans and computer reconstructions in colour, as well as a good textual commentary. It takes a while for the page (5.31mb) to load, but it is well worth the wait. Click on the Amarna link in left hand navigation bar on the PDF page, or go to pages 11 through 21. A Discovery Channel news item about use of tar in mummies and the trade in oil in the Middle East 3000 years ago. A more popular-style article and slightly longer item than the 6th Feb article reporting the same thing in Geotimes (http://www.geotimes.org/current/NN_mummytar.html). Is there a Mafia in Egyptology? Zahi Hawass in his regular Al Ahram spot talking about the internal politics currently being played out in the French Institute in Cairo (IFAO). "In Al-Gurna where several excavation missions are probing for more Ancient Egyptian treasures under the sand, a team from the Polish Centre for Mediterranean Archaeology has stumbled on a major Coptic trove buried under the remains of a sixth-century monastery located in front of a Middle Kingdom tomb. " The December 2004 issue of the British Museum's online publication, the "British Museum Studies in Ancient Egypt and Sudan (BMSAES)" has been published on the BM's website at the above address. Quotes from Zahi Hawass re the Tutankhamun scan, the results of which are now expected at some time in March, according to this article from Reuters. The Egyptian Gazette interview with Zahi Hawass, covering everything from the next stage in the Cheops "air vent" exploration, the initial results from the Tutankhamun scans, new museums planned, and the SCA policy on submerged archaeology. 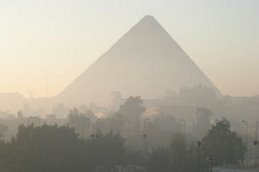 Another article about research being taken out in order to understand Egypt's climate around 130,000 years ago. It is hoped that the research could shed light on the possible role weather and climate played in the dispersal of humans "out of Africa" and into Europe and Asia. New Scientist article about a new collection of animal mummies being studied by the Natural History Museum in London, UK. X-ray analysis of the skeletons of some of the animals, particularly cats, suggests that they were deliberately killed in order to be used in religious activities. Other cats, however, were considered to be pets due to the elaborate nature of the mummification they received. The mummified animals are drawn from many collections and include crocodiles, falcons, baboons and cats. The collection will also go on display at the Walter Rothschild Zoological Museum in Hertfordshire, UK, from 14 February in an exhibition called Animal Mummies of Ancient Egypt. More from "Travellers in Egypt"
The most recent offering is an excerpt from "Orient Line Guide - Chapters for travellers by sea and by land" entitled "From Suez to Cairo" (London, 1890). It is a narrative description, mainly of Cairo, in which the author tries to convey not merely the look of areas and features, but the impact they have on visitors. The text is accompanied by some fine drawings of the Meidum pyramid and the "Boolak Museum" (the Cairo Egyptology collection in one of its former homes). Discovery frequently create and air programmes about Egyptology, which are sold on to other channels as well, and therefore receieve a very wide audience world-wide. The most notorious of these programmes was probably Joann Fletcher's "Nefertiti Revealed". This reasonably detailed article previews Discovery's latest offerings - five new documentaries and a 13-part series. It is an interesting review of the approach taken by Discovery not only to Egyptology but also to target audiences. One of the programmes covers Hawass and his attempts to recover items removed illegally from the country. A feature on Siwa oasis discussing everything from the archaeology and natural history in the oasis area to the best hotels and "ecolodges" in which you can stay. I never had much motivation to visit Siwa, but this article paints a much more attractive picture than any I have read previously - it looks fascinating. TourEgypt's most recent featured story concerns Qasr Qarun, the fortress and temples in the ancient town of Dionysius in the Faiyum depression, situated near the shores of modern shores of Lake Qarun. The town was considerably important, being the terminus of the caravan route to the Egyptian oasis of Bahariya. A new study of tars used in the mummification process suggests that the ancient Egyptians sourced tars from a number of different sources in Egypt and the Near East. This article, in Geotimes magazine, is a summary of an article which appears in the Journal of Geoarchaeology. Analysis of silts "from a small lake (now dry) in the Kharga Oasis of western Egypt to reconstruct climatic conditions during the lifetime of the lake. Their analyses support a surprising picture of arid Egypt: 130,000 years ago, what everyone considers an eternal desert was actually a thriving savannah, complete with humans, rhinos, giraffes and other wild life." Have a look at this article - it isn't very long, but it is fascinating. The transcript of a Voice of America transmission about the discovery of Graeco Roman mummies in Bahariya. Copied from the Egytian State Information Service website: "The Spanish archaeological mission under the National Antiquities Museum in Madrid has unearthed about eleven tombs built with unburnt bricks inside a cemetery dating back to 2061- 2190 BC", Minister of Culture, Farouk Hosni said adding that the mission found fake gates, religious paintings and courban tables. For his part the Secretary General of the Supreme Council of Antiquities, Zahi Hawas said that the mission has unearthed 12 chambers built with unburnt bricks with arch ceilings. The mission also found chains and necklaces made of precious stones with the shape of sea shells, added Hawas.